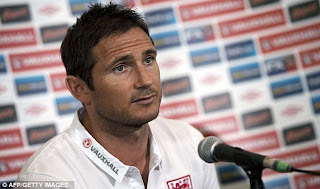 Chelsea midfielder, Frank Lampard faces a race against time to be ready for Euro 2012 after pulling up in training with a thigh injury. The England midfielder picked up the injury on Wednesday morning and faces a crucial fitness test on Thursday that could decide whether he makes the tournament. After the loss of Gareth Barry on Monday, it is another major headache Englandboss Roy Hodgson could do without. An FA statement read: 'Frank Lampard has today pulled up in training with a thigh injury. 'He will have a scan and be assessed by the England medical team tomorrow. Hodgson has already seen squad members Barry and John Ruddy withdraw with injuries, while Jack Wilshere and Darren Bent are long-term absentees. Liverpool midfielder Jordan Henderson has been put on alert if worst fears are proved correct.